When planning for a new baby on the way, a lot of factors need to be considered. Do you have everything you need to welcome baby into the world? If you’re not completely sure, or you just want a way to better organize your home for baby, a printable baby checklist is just the thing to keep track of your planning for your bundle of joy. Get your own newborn baby checklist for free here! 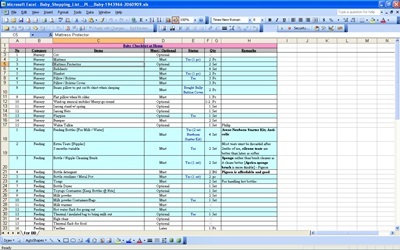 What Is The Newborn Baby Checklist Template? A printable baby checklist is a newborn baby checklist that can be customized to any level of preparedness. These are especially convenient to use after your baby shower, when you have made a list of all of your received gifts and you need a great way to organize everything. Customize your newborn baby checklist into categories of clothes in monthly sizes, or use a printable baby checklist to give to friends and relatives who want to buy something for baby, but don’t want to duplicate what you have already received. A printable newborn baby checklist can be used to keep track of diapers, bottles, wipes, or any other supply you want to stock up on. You can also use the newborn baby checklist as a guide to ensure you have everything you need for your baby at the hospital after he or she is born. The newborn baby checklist will ensure that more time can be focused on baby than is spent stressing about whether or not every supply and article of clothing is accounted for. A newborn baby checklist is so versatile, any parent can benefit from this printable baby checklist template. It may be just the thing to download and send to a friend who is expecting a child; especially if they have been stressing out about the preparations for their new baby. Everything is covered on the newborn checklist, from cribs and clothes, to diapers and pumps. No parent will ever have to worry about being completely prepared with the great newborn baby checklist template.